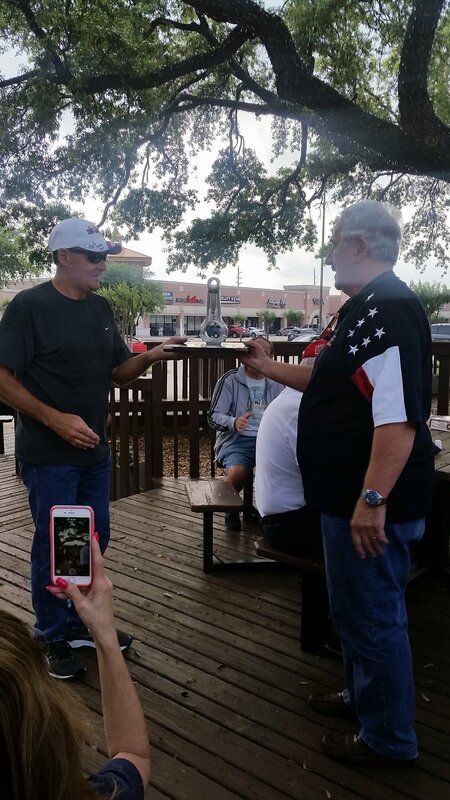 For many years now, North West Houston Vettes and Rods has been recognizing its members for having the fastest cars in the Club. Our Speed & Quickest ET award is named after the Godfather of Drag Racing, Big Daddy Don Garlits of Ocala, Florida. The latest recipient of the Big Daddy Award is Craig Calmus. On November 15, 2016, Craig's 1968 Pontiac Firebird turned in a time slip of 8.20 seconds at 165 mph in the 1/4 mile at Royal Purple Raceway, Baytown TX. That was an an outstanding achievement and the fastest time ever turned in by a member since the founding of the Club in 2004. On hand to accept the award from Tony Accardo were Craig and his wife, Sherry and several members of their family. In the Calmus family, Drag Racing is King and Craig hopes to best his best time in the near future. Congratulations to Craig and his Racing Team for a job well done.